When I was 7, I went to Slappy’s Circus Camp, a week-long day camp. That’s where I met Slappy and Monday, and where I fell in love with the circus. I’d never been to a circus before, and never seen a clown live — just on TV. And Slappy and Monday aren’t just any clowns. Monday used to run the Clown College for Ringling Brothers, and they’ve performed all over the world. They’re great teachers, and nice people, too — and they have kids who are about my age (Chet and Lily) who are cool, too. So I was really excited when I heard that they were coming to my school. I’ve seen them perform pretty often, but I’d never seen their Circus Science show, and I still haven’t seen their Circus Math show. You can see videos of both, and find out how to get them to come to your school or church or Scout troop by clicking here. My school has “Fun Fridays” once every six weeks, where there is some kind of program in the school cafeteria. 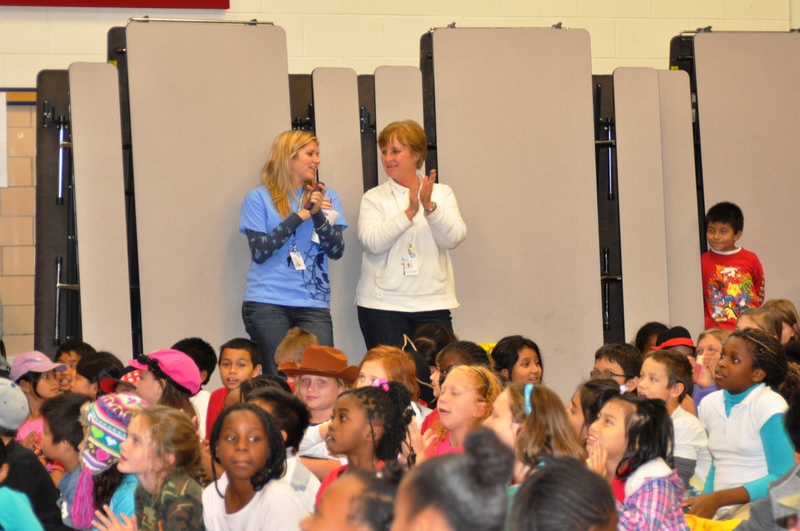 About 350 kids sit on the floor, and someone is on stage. Sometimes the people on stage aren’t all that good, and it can get kind of boring. You’ll see kids talking, or just closing their eyes and wishing they were somewhere else. 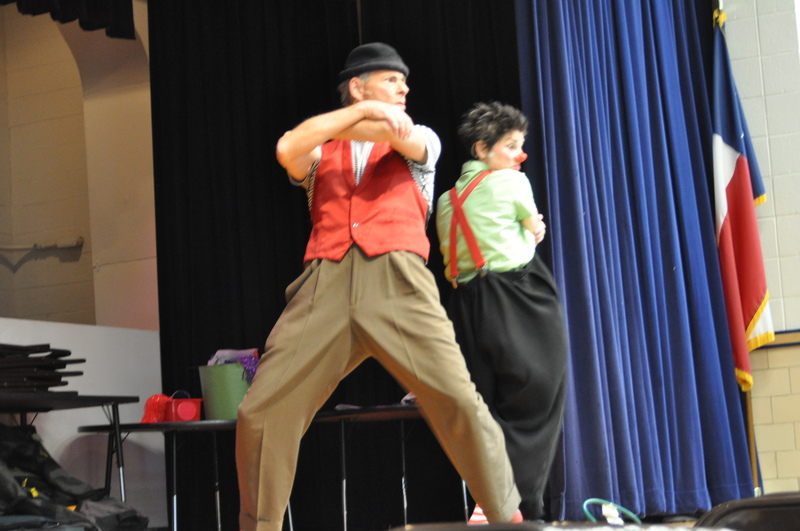 You didn’t see anything like that on November 4 when Slappy and Monday were on stage! 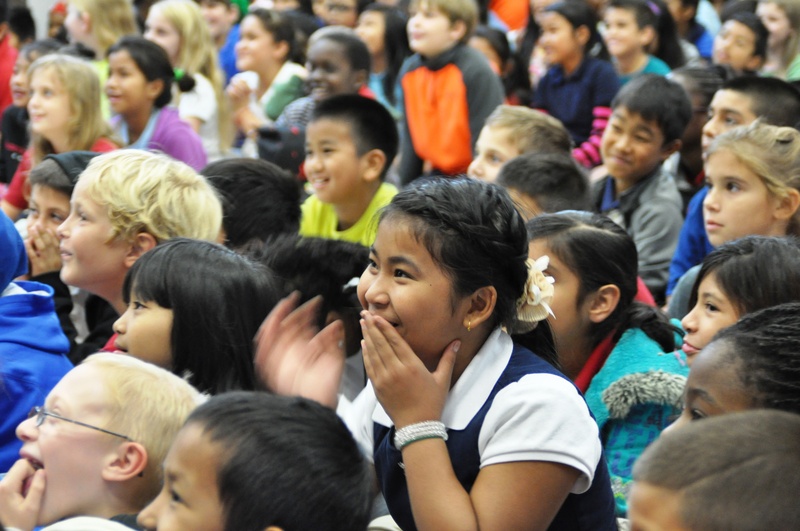 Everyone in fourth through sixth grade was laughing, and I saw kids raise their hands to answer Monday’s questions who would never raise their hands to answer a teacher’s question in class. We had so much fun that the only problem was that it was hard to stop laughing. Here are some pictures from the show. If you get the chance to see Slappy and Monday, definitely take it. Slappy’s Holiday Circus will be at the Dallas Galleria every Saturday starting November 29th, at 1 and 3 p.m. My friends Chet and Lily Monday will be performing, and so will some of the adults from the Lone Star Circus — but Slappy and Monday are the stars of the show. It’s a great way to see them perform free. If you miss them there, they’ll be at Dallas Children’s Theater December 27 to January 5, in Charivari, the Lone Star Circus’s Holiday Show. Tickets for that are on sale now. Can you find me in this photo? I’m near the back, on the left side — I’m wearing a black jacket over my school uniform shirt. The lady in white is my science teacher, Mrs. McCoy. She’s a good teacher, but I saw kids raise their hands to answer Monday’s questions who’d NEVER answer a question in class. Slappy and Monday’s Circus Science is real science — and really funny, too. 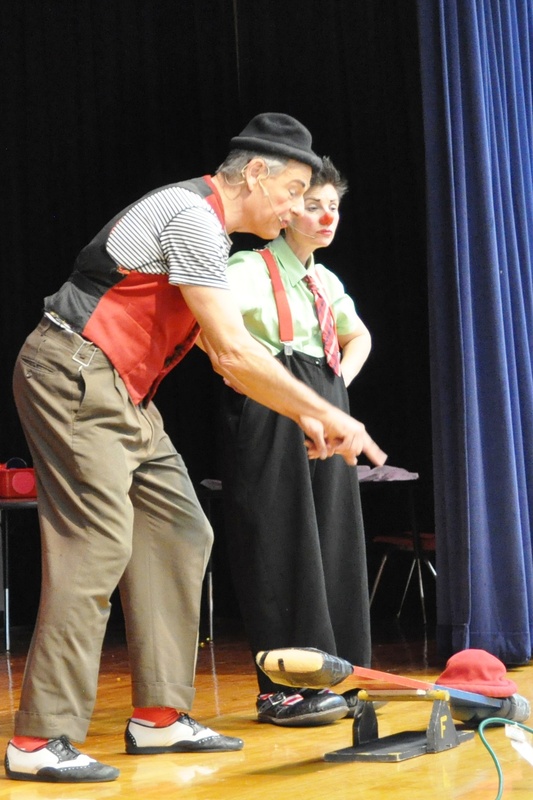 They teach kids about Newton’s laws of motion, simple machines, gravity, and other important stuff like centrifugal force — and show how it’s used in the circus. Who knew Newton’s Third Law of Motion was so funny? It makes sense though. 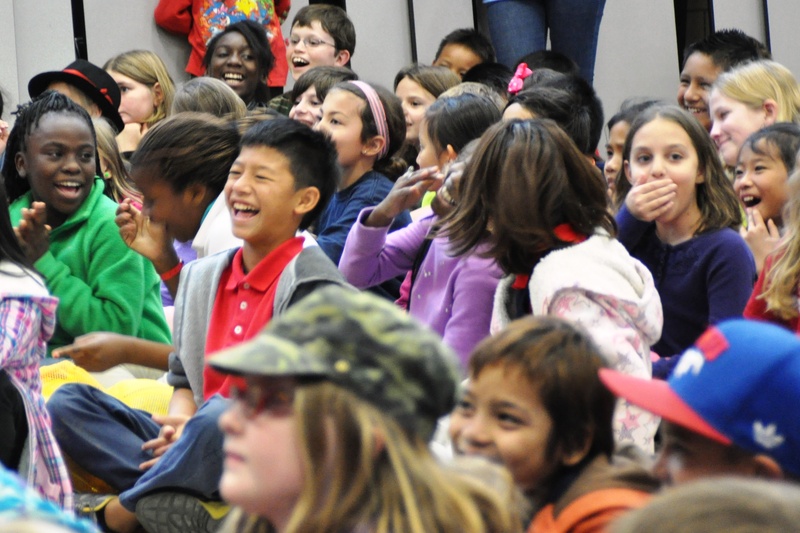 Slappy and Monday get on stage (the action) and kids can’t help laughing (the equal and opposite reaction). 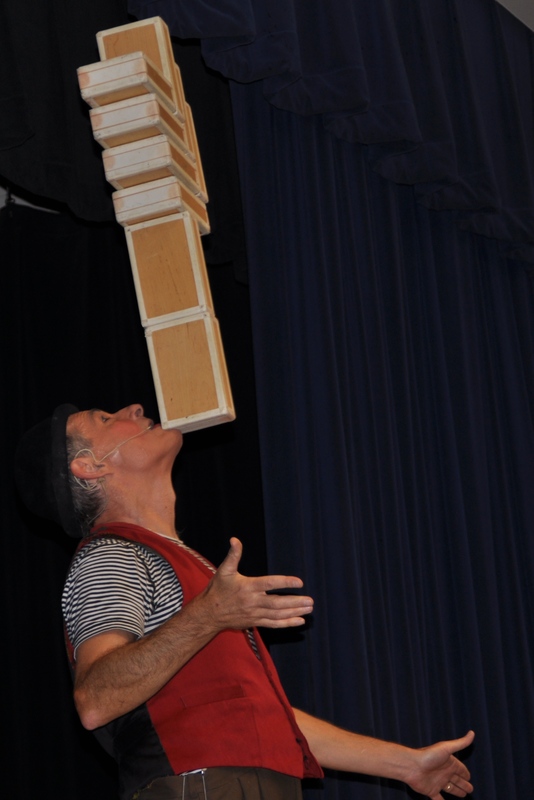 Balancing boxes and juggling with them is hard — I know, I’ve tried. But Monday says gravity does all the work. One kid was SURE there had to be magnets holding the boxes in place, but Monday let him handle one to prove they’re just wood and leather boxes — balanced by a lot of hard work and practice, and held in place by gravity. Slappy does this dance where she pretends to get all wrapped up in the ribbon — and when Monday comes to help, her skirt gets caught in the ribbon too, and she winds up standing there in a pair of Batman boxer shorts. It’s hilarious. 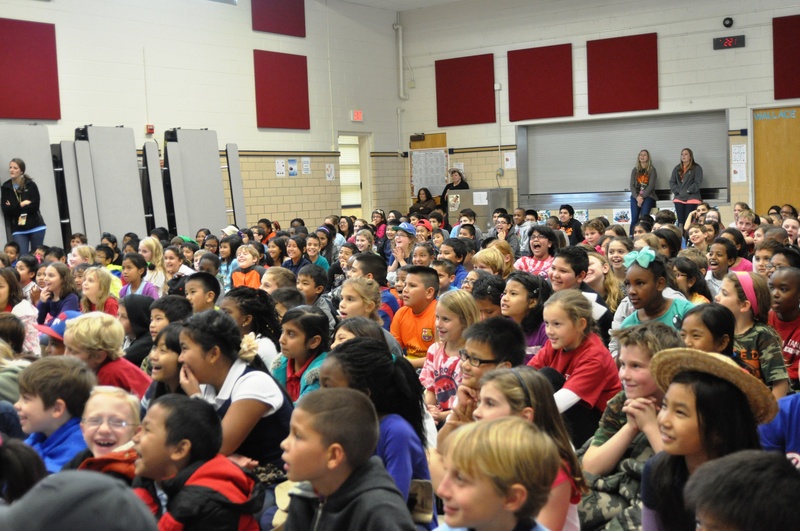 Slappy and Monday’s Circus Science Show lasted 45 minutes — right up until the bell rang for kids to go home. But instead of rushing out, kids stayed where they were, hoping the show would keep going. That lets you know how much fun they were having: they were ready to stay after school on a Friday to see more of it! I just love these clowns! They’re super nice people, great teachers, and great performers. 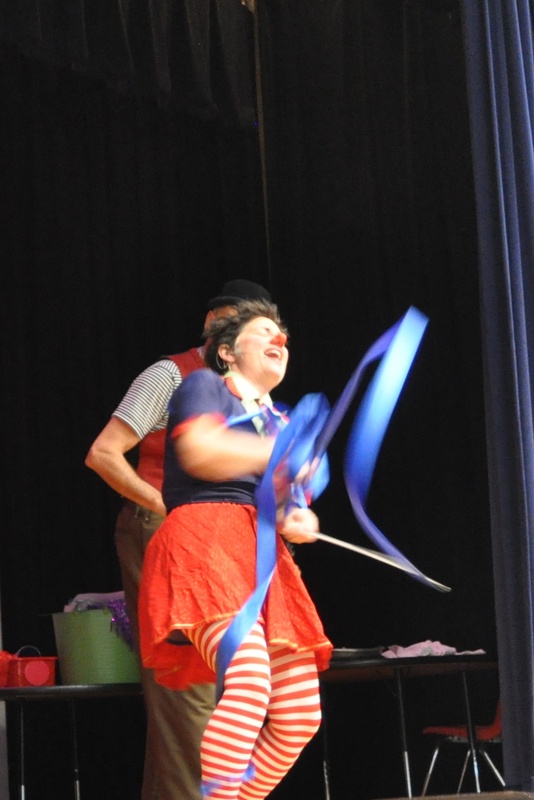 I fell in love with the circus after spending a week at one of their summer camps. They are amazing!